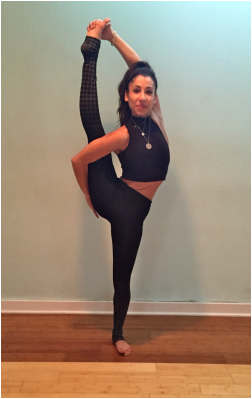 Stephanie comes from a dance background and was first introduced to yoga in 2003 as a cross-training practice to strengthen her ballet technique. It took several years for her to find Village Yoga in Potomac and make her practice there a consistent part of her life. Once she did, her eyes were opened to the true power of yoga that goes far beyond the physical benefits she was originally seeking. While yoga has been excellent for her strength, flexibility, and overall physical health, it has also helped transform her relationships with herself and others, and this is the gift she hopes to share with her students. Stephanie received her RYT 200 training through her teacher and mentor, Freddy Margolis. She is extremely grateful to him for his invaluable guidance and for encouraging her to become an instructor. Stephanie’s classes flow fairly vigorously and use creative sequencing to help students find their own rhythm. You can expect to sweat and to be introduced to new challenges; however, her goal is always for every class she teaches to be fun and accessible to every yogi regardless of experience. She looks forward to meeting you on your mats!